Before we get started today - here's a shout out to Brendon Urie, lead singer of the popular band Panic! At the Disco who has been saying some nice stuff about my project in his twitter feed over the last day or two. Thanks Brendon! The "Biocentric Universe Theory" says that without life there is no time, no space, no cosmos. Do you agree with this idea? Poll ended July 23 09. 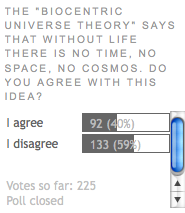 40.9 % agreed while the remainder, 59.1% disagreed. This blog, of course, relates to an entry I published a few months back in my blog called The Biocentric Universe. There was a followup to that entry called The Biocentric Universe Part 2 which is also part of this discussion. It's interesting to me how some people can't wrap their minds around this concept because they are so mentally trapped in the "cause and effect" reality of the world they see around them. Trying to visualize how life could retroactively "fine tune" the basic physical structures of our universe seems like a chicken and egg scenario - how could life fine-tune the universe if the universe hadn't already had its initial conditions fine-tuned to allow life to come into existence in the first place? It boggles the mind. In entries like Why Stop at Ten Dimensions? , I've talked about similar "turtles all the way down" loops which don't seem to make sense until you can find a way to divorce yourself from our linear 4D spacetime perspective of cause and effect: if the difference between past, present, and future is meaningless once you get out to the proper viewpoint "outside" of spacetime, then questions like "which came first" no longer have any relevance. In my popular blog entry Creativity and the Quantum Universe, we discussed other new lab experiments which appear to prove that life is a process which operates beyond the limits of our narrow one-planck-length-at-a-time window into the information that becomes our reality. Is there any other proof that life exists outside of spacetime? What if I told you there was evidence that the "spark of life" I'm always talking about can lie dormant for not hundreds, not thousands, not millions, but tens of millions of years and still arise and flourish when conditions are right? Would that convince you that life is a process which, at its core, exists outside of our limited 4D spacetime reality? We'll talk about that more in an upcoming blog. Here's a couple of my songs about that mysterious, timeless spark which each of us carry within us. There's a mind-boggling new theory that has just been proposed by theoretical physicist Lorenzo Moccone, currently at MIT, which may tie into all this as well. We'll look at his theory next time in "The Quantum Solution to Time's Arrow". Polls Archive 46 - Big Bang an Illusion? Polls Archive 45 - Conscious Computers?